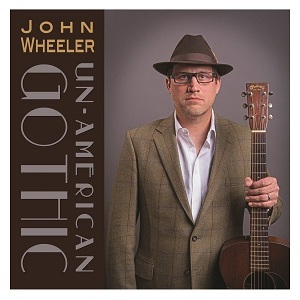 “Un-American Gothic” is the first solo album from Hayseed Dixie frontman John Wheeler. The rockgrass band have toured intensively and after performing over one thousand live shows and ten albums they've decided to take a couple of years off from Hayseed Dixie. John Wheeler has chosen to spend some of this time off to make a solo album that lets hum explore different musical styles and lyrical subjects. The album includes two covers - "Masters of War" by Bob Dylan, and "Eton rifles" by The Jam, and nine original tracks which cover subjects including the banking crisis and more personal subjects or feelings. Taking the lyrics first of all, this is a beautifully written album. Songs such as "Deeper in debt" cover serious subjects but with a bit of wit thrown in. Songs such as "Street sweeper lullaby" carry plenty of emotion in the lyrics. The whole album is packed with great lyrics that are definitely worth listening to. Musically the album is a significant departure from Hayseed Dixie (with the only link being the use of violins in some songs), being more of a folk-rock album than anything else, although there are elements of Country in here too. There's plenty of variety in the sounds and the pace of songs. "Doomsday dance" is a great song. It's got quite a brisk tempo and the violin sections remind me of the Levellers - this song is definitely likely to appeal to fans of theirs. The two cover versions are both excellent. Often when I hear a cover version it compares badly to the original, particularly when the original is a much loved classic such as "Eton rifles", but John Wheeler has done a great job on both covers, and his voice is perfectly suited to "Eton rifles". He's not done a straight copy though - his version of "Eton rifles" is a stripped down version with just vocals and piano for almost all of the song, and I think that really helps make his version work so well. "Un-American Gothic" is a great album that's well worth a listen.